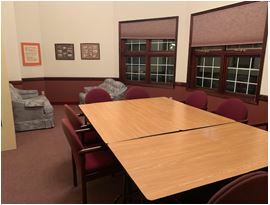 A comfortable room on the main floor for small meetings, discussion groups, or other types of gatherings. Equipped with chairs and tables, the Lounge can accommodate 10-15 people. Floor to ceiling windows face west. A gender-neutral / accessible washrooms is adjacent, and access to the kitchen can be arranged through the church office.